A sweet gift for the one who knows the code to your heart. This pendant settles the debate about whether or not computers can feel emotion. Heck, yes! 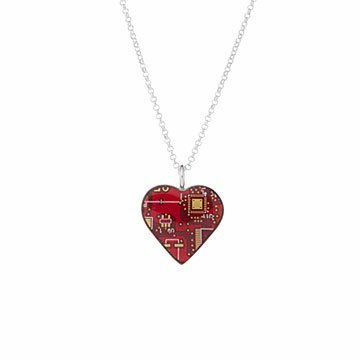 Made from upcycled circuit boards, it's a declaration that you are a a proud, card-carrying geek and b a hopeless romantic. The necklace, available in either crimson red or royal purple, makes a sweet gift for the person who knows the code to your heart. Handmade by Drew Johnson in Colorado. Due to the recycled and handmade nature of this item, each is unique and will vary. Drew Johnson sometimes refers to himself as a junkman, or a "recyclopath." But when you see what he can do with discarded circuit boards, you might also want to call him a creative genius. Drew has long been an advocate for sustainability, and it was while he was working for an electronics recycling company that the idea occurred to him to make a neck tie out of discarded circuit boards. The idea was inspired by a cork tie his mom gave him from—you guessed it—UncommonGoods. Drew began making more and more of the ties, as well as adding new products to his growing catalogue. What began as a crafting hobby soon turned into a business—one which has earned Drew awards for his earth-friendly vision. 1" L x 1" W x .1" H Chain: 18"
Wipe gently with soft cloth.